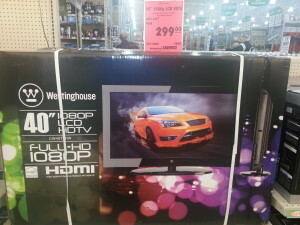 Westinghouse 40" 1080P LCD HDTV - Only $299 at Menards | A Savings WOW! While Jim was at Menards purchasing newspapers, he spotted this HOT deal. They have a Westinghouse 40″ 1080P LCD HDTV for only $299! That’s the lowest price we’ve found for this TV.